Positives: Fixtures: The Crows are no chance of making finals in what has been a poor year for the club after the heights of last season. However the performances of star recruit Bryce Gibbs have been a positive. Whilst he hasn’t set the world on fire, the former Carlton ace has been more than serviceable since returning to his home state of South Australia. This weekend, however, Gibbs and the Crows fly to Melbourne for a clash with Carlton at Etihad Stadium. The Blues obviously sit last in the ladder with just two wins under their belts, making this a game Bryce should score highly in. Adelaide have travelled to Victoria four times in 2018 with Gibbs managing scores of 139, 129, 107 and 92. It’s a genuine dead rubber, however you can pretty safely rest assured Gibbs will produce the goods this weekend. Ceiling: Gibbs has managed just the three scores in excess of 120+ this season – 139 in a near-BOG performance against the Bombers, 129 against St.Kilda and 142 in the Crows first ever loss to the Giants. So whilst he hasn’t had a high volume of these big scores, it’s pleasing to know that he is more than capable of reaching great heights. Those who played the game last year will likely be aware of Gibbs’ score against the Suns at Metricon Stadium last season, when he still wore the navy blue of Carlton. Gibbs had 43 disposals (31 kicks and 12 handballs), 8 marks, 10 tackles, 4 free kicks for and slotted home two goals to finish off an amazing day at the office with 194 Fantasy points. Negatives: Number of ‘big’ games: It’s a fairly uninspiring argument with a questionable amount of traction, however I think it warrants a mention so here goes. After running your eyes over his season scores, I can’t help but notice Gibbs has recorded only one score higher than 120 since round three. Since then he has remained consistent, posting nine tons, but the 142 against GWS stands alone as the sole ‘big’ score for a long while. Given he was only able to score 100 against Carlton at home in a secure 55-point victory, can he really expected to go big this weekend? Positives: High Ceiling: Throughout his 10 years at AFL level, Sidebottom has demonstrated to us that on his day, he can score very well. He sets up these big scores by racking up a heap of the football, often across the wing and flanks. Sidey has a regular, almost weekly impact on the scoreboard and is certainly not unfamiliar with kicking a bag. When allowed to roam, he racks up mark after mark and hits targets with precision on either side of the body. In 2018 he has five scores of 120+ (including efforts of 130 and 137 in rounds 3 and 4), having managed a total of six 120+ scores in 2017. Whilst he may not have 150+ outings, Sidebottom instead gives owners high scores on a more consistent basis. Having Steele in your side certainly makes watching Collingwood more enjoyable when he’s on song. Consistency: We’ve established that Sidebottom goes big often enough, but even when he doesn’t explode, the dual-sided premiership star will still more-than-likely hit the three figures. Last season, where he finished with an average of 105 from all 22 games, Sidey went under 100 six times, with three of those scores landing in the acceptable 90’s. And just 5 of 14 hundreds were under 110. Ceiling and consistency are obviously keys when picking premo’s, and the Magpie ticks both boxes, having tallied 12 hundreds and five 120+ scores this season. Negatives: The Tag: It’s been the case on a couple of separate occasions across the past couple of years, but this season the tag has become a more serious issue for Steele Sidebottom. With star teammate and fellow midfielder Adam Treloar on the sidelines for an extended period, Sidey has copped tags from Gold Coast, West Coast and Sydney in the latter half on the year. Unfortunately for him, his owners and the ‘Pies, Sidebottom’s production has was significantly halted. Unable to crack the ton in any of the three games, Steele instead produced scores of 81, 48 and 70 – ironically his three lowest scores for the season. So do the Dockers, who host Collingwood this weekend, send a tagger like Bailey Banfield to the guy who managed 37 disposals and 131 points against them back in round 11? Not out of the question. Verdict: This decision really comes down to whether or not you think Sidebottom will cop a tag. If it appears that he will, the stats suggest he will struggle. However he has a higher frequency of big scores than Gibbs. For me I’d go with Sidey, as I believe he will escape any added attention and should score well as a result. Positives: Consistency: David Mundy is not exactly a household name in Fantasy circles, however strong consistency this season has seen the Docker receive greater recognition by us coaches. Whilst he has only managed to hit the three figure mark on six occasions, the former skipper has dropped below 80 just three times, with his scoring predominately situated around the 80-95 mark. One thing that stands out when glancing over some of his key statistics is the evenness and balance in his game. This season he is averaging 22.8 disposals, 4.6 marks, 4.2 tackles and a close to a goal a game, all contributing to a current average of 91. Form: The Dockers got destroyed down at the cattery on the weekend, however Mundy still managed to find 22 disposals, 4 marks, 4 tackles and kick one of his sides only goals. In the month prior to the 125-point loss, Mundy hit his best patch of form for the season. He managed scores of 122, 58, 128, 108 and 103 for a five-game average of 103. These numbers aren’t ground breaking by any means, but they are pretty good when you consider Mundy would likely sit at F6 in your round 23 side. Negatives: Ceiling: So yes, it has been acknowledged that David Mundy has had solid consistency across the season and has hit a richer vein of form over the past handful of rounds in particular, but can he be relied upon to go big in the final week of the home and away season? If the statistics are anything to go by, that seems doubtful. His only two 120+ scores have come in the past month and a half of footy, yet prior to that he had just two tons for the year and was on a run of 11-straight rounds without toning up. No disrespect to the Freo warrior, however if you’ve been good enough to make it to a Fantasy Grand Final, I’m not sure selecting Mundy is cause for a great increase in optimism. 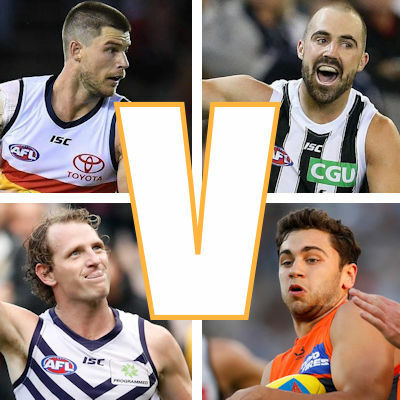 Fixtures: I don’t see this as a major negative to selecting David Mundy for this weekend, however his Dockers face Collingwood at Optus Stadium to bring the year to an end. The ‘Pies are ranked sixth for points against this season and sit in the middle of the pack for average 100’s conceded. If Collingwood do what Geelong did last week, it is more than likely to stop Mundy from getting owners the score they’re after. Positives: Form: Taranto was taken with the second overall selection of the 2017 National Draft as a half-forward who was also a capable ball winner when slotted into the on-ball brigade for TAC Cup club Sandringham or Victoria Metro during the mid-year National Championships. With his foot skills, class and x-factor, Taranto made a near-seamless transition into senior football, breaking through for a dozen games in his rookie year for an average of 61. However this season he has made a spot in the midfield his own, which, as would be expected, has seen his average skyrocket. What has been most impressive to me is his tackle numbers (averaging 6.3 per game), which have accounted for approximately a quarter of his scores per game. The Victorian is also averaging 21 disposals, 3.5 marks and has kicked 6 goals. In his last three games, Taranto has recorded scores of 102, 91 and 119. Given his relatively low ownership, wouldn’t it be handy if he could keep the form going for one final week. Negatives: Consistency: It’s far from uncommon for a 20-year-old, however Tim Taranto has struggled for a bit of consistency in his Fantasy scores at various stages throughout his second year in the business. Whilst TT’s seven tons to-date is a strong return for such a young player in a finals-bound side, the five sub-80 scores would have no-doubt caused much frustration amongst owners. These statistics wouldn’t fill owners heading into Grand Finals with an awful lot of confidence, despite his impressive performance on the weekend. Fixtures: The Giants clash with Melbourne in what could potentially be the best game of the final home and away round. Melbourne, whose midfield is led by stars Clayton Oliver, Max Gawn and Angus Brayshaw, has proven to be relatively effective at restricting opposition scores. They are ranked 9th for total points against, eighth for 100’s conceded and, perhaps most tellingly, third for 120’s against. Over the last three weeks, the Dees have lifted their overall rankings in total points and 100’s against, with wins over West Coast and Gold Coast. Verdict: Perhaps I’ve been a bit harsh on David Mundy, who has been a real battler for the Dockers since debuting in 2004. Both him and Tim Taranto have had their moments this season without really managing any significantly high scores. I’ll lean towards Taranto here. The Hoff is a guaranteed 90-110. Hawkins will go 60 – 150. Depends on how brave you feel. Who do I flick for Seb? Coniglio, Parker or Neale? I feel Neale is a safer bet at home against the magpies but coniglio could attract a tag…? Hmmm big decisions at the pointy end of the season!! It’s lucky I was getting rid of Rockcliff anyway. Geez, wonder if any coaches are contemplating trading out both Rocky and Titchell? Offloading two Pigs at the same time? Gotta be bad fantasy karma surely?! Great work again, Tom! Thanks for your articles all year. Always insightful!